Van harte gefeliciteerd en een mooie beloning voor alles wat er al door TNT onder zijn leiding is gedaan om uit te groeien tot een Nederlands en wereldwijd voorbeeld van duurzaam ondernemen. De andere Awards gingen naar: His Excellency Paul Kagame, President of the Republic of Rwanda in de categorie Leadership in Public Service. Asha Hagi Elmi Amin, Chairperson, Save Somali Women and Children in Leadership in Civil Society. Dr. Rola Dashti, Parliament Member, State of Kuwait in?Leadership in Public Service. Ruchira Gupta, President, Apne Aap Women Worldwide in Leadership in Civil Society en Quincy Jones, Founder, Quincy Jones Foundation in?Leadership in Philanthropy. jammer dat hij z’n werknemers als een hond behandeld!! Every day, all over our world, the work of the William J. Clinton Foundation continues to make a profound difference in people’s lives in practical, efficient, and measurable ways. Learn how President Clinton and his Foundation have worked to improve access to investment, opportunity, and lifesaving services in the United States and around the world. At the 2010 Clinton Global Citizen Awards, Jean-Max Bellerive, Prime Minister of the Republic of Haiti, presents the award for Leadership in Public Service to His Excellency Dr. Leonel Fernández, President of the Dominican Republic. At the 2010 Clinton Global Citizen Awards, Andrea Jung, Chairman and CEO, Avon Products, accepts the award for Leadership in the Corporate Sector. At the 2010 Clinton Global Citizen Awards, Suraya Pakzad, Executive Director, Voice of Women Organization, accepts the award for Leadership in Civil Society. At the 2010 Clinton Global Citizen Awards, Dr. Jean W. Pape, Director, Les Centres GHESKIO, accepts the award for Leadership in Civil Society. 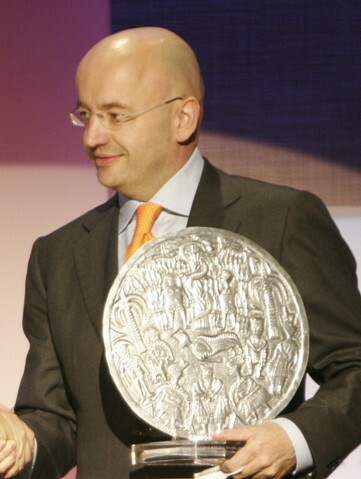 At the 2010 Clinton Global Citizen Awards, Dr. Mohammed Ibrahim, Chairman, Mo Ibrahim Foundation, accepts the award for Leadership in Philanthropy.